The annual report has, over the last number of years, become more involved, with greater expectations placed on it to be a valuable source of information for stakeholders. It has also become an integral vehicle for companies to set out their vision and strategy for the future. With the ever changing landscape of global challenges, this has never been more important. 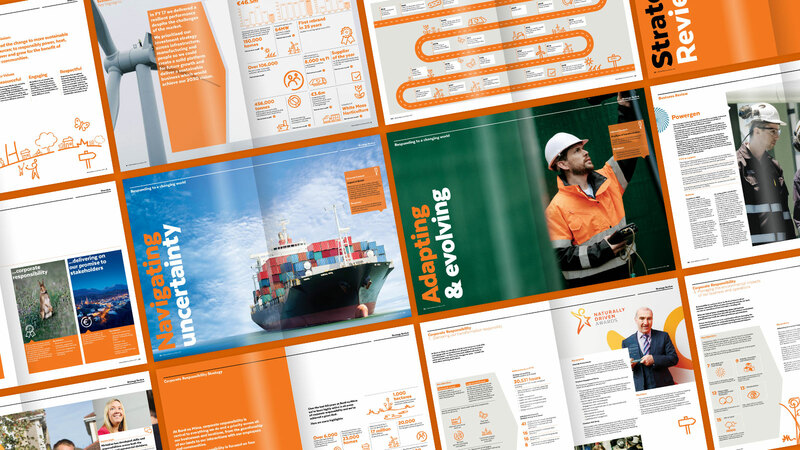 Through our experience and industry research we have identified four key themes in reporting that are helping to inform the structure and design of annual reports for our clients, enabling them to differentiate and reaffirming their leadership positions in the markets in which they operate. Many reports lack individuality or an ownable voice. They can struggle to communicate what makes their story compelling or their business model unique. Individuality reflects a company’s confidence, helping to build relevance which sets them apart from their peers and highlights the energy of forward thinking. Reporting becomes really relevant when the business model and its impacts are illustrated in a wider context. With multiple stakeholders, it is important that they are placed to the fore when structuring content. Understanding how your business aligns with various stakeholder groups and what impacts the organisation is having in the sector is crucial. Relevance is less about the products and services an organisation offers, but how the organisation is affecting the world around us. Over the past fifteen years, much additional reporting burdens have been placed on businesses, and many of the existing requirements have also changed in that period. As brand and design agencies we have a responsibility not to overcomplicate the commentary. A great report should bring clarity, be precise, explain complex accounting and reporting issues and avoid jargon at all points. The report should be easily read and understood by all members of the organisation, not just the authors of it. 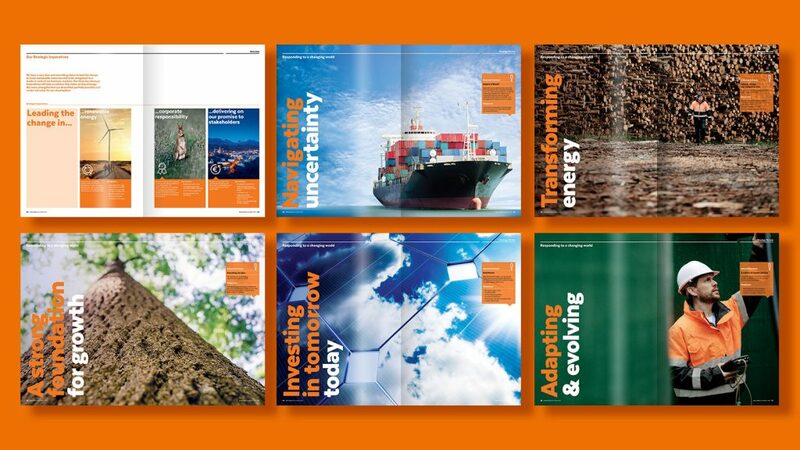 In practice these four themes are brought to life in our recently designed annual report for Bord na Móna. 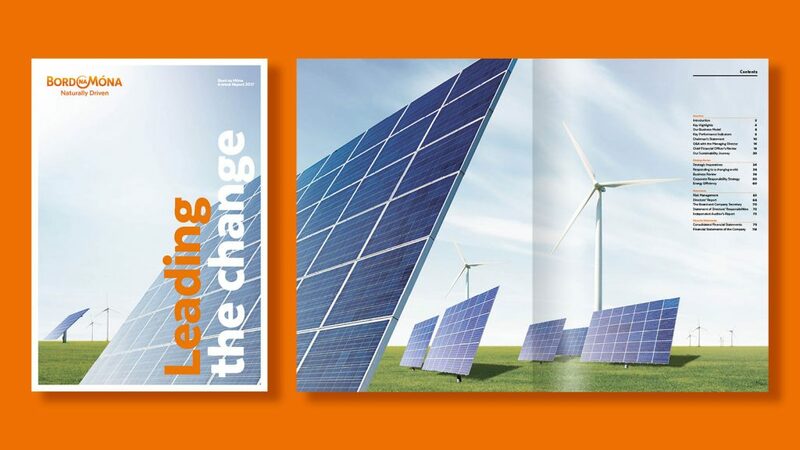 With a powerful title of ‘Leading the Change’ we were able to position the company as leaders, at the forefront of an evolving industry. This individuality was further illustrated by giving the people that work in Bord na Móna a voice. These took the form of employee insights with an individual from each area of the business given the opportunity to speak to how their role supports the broader company strategy. A key challenge was to detail how Bord na Móna are responding to a changing world. By elevating their three strategic imperatives and the key initiatives within each one, we could show how they will achieve their vision to lead the change to more sustainable resources and to be recognised as a leader in each of the markets in which they operate. We highlighted the key external challenges that will impact their long-term strategy, and the internal actions the company is taking now to secure their 2030 vision. By doing this we are demonstrating Bord na Móna’s proactive strategy, and how they are well placed to respond to the key challenges facing it, all of which answers the questions and concerns of key stakeholders. 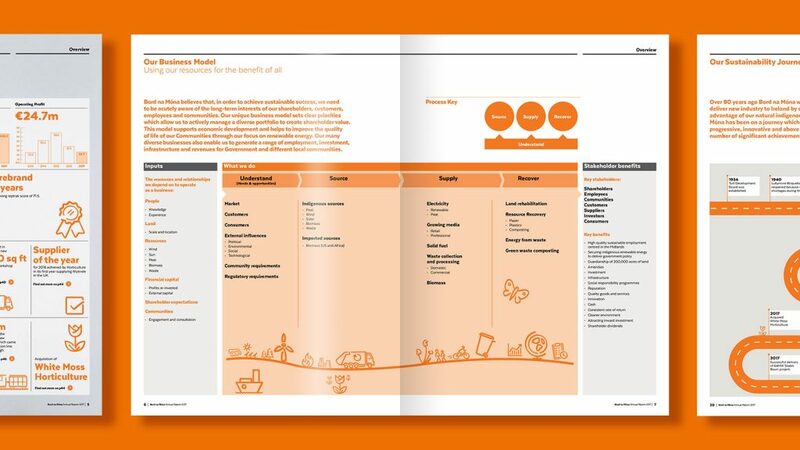 We visualised their business model to ensure its relevance to the different stakeholders, illustrating the unique inputs that enables them to operate and identifying the key stakeholder benefits resulting from their operations. Sustainability and corporate responsibility reporting has become increasingly relevant to companies and their stakeholders. At Bord na Móna corporate responsibility is a priority in all that they do. We brought the 4 key objectives of their corporate responsibility strategy to life in a visually engaging way that mapped out their key objectives in each area and highlighted the actions that Bord na Móna are taking to achieve them. 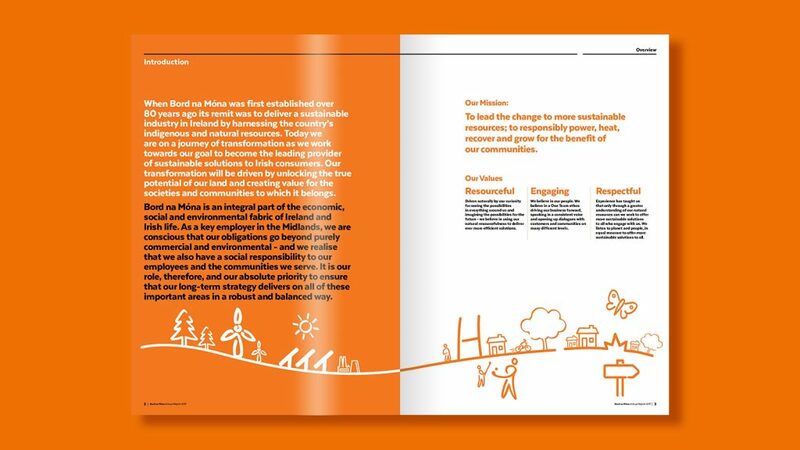 The final report is an engaging overview of their year that not only tells Bord na Móna’s story but also brings to life their 2030 strategy through the use of a compelling narrative and a bold visual style that aligns with the reports theme of ‘Leading the Change’.